« How Exactly Are You Supposed to ‘Get Over It’ ? Recently, I wrote that the energy sector was bottoming based on the bullish percentage index. The general market was weak and the energy sector especially so. According to my analysis, it had become stretched to the downside and was ripe for a snap-back rally. My next step is to look for stocks within the sector that were falling into clear support levels. When I find them, I don’t automatically rush in and buy though. Instead, I wait to see some indication that buyers have returned and that the tide is turning. After I see that and enter, I place my stop where it would clearly show that support has been violated. And finally, for my target, I usually use the previous swing high. 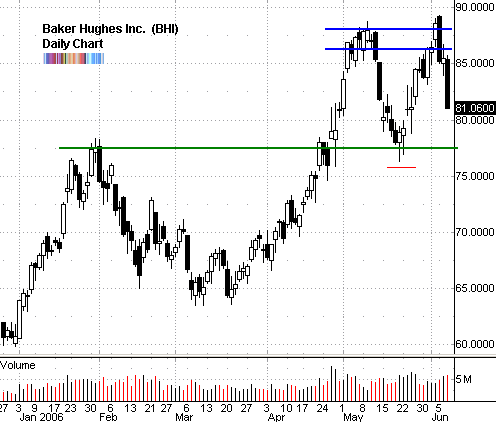 As you can see from the daily chart, BHI had been in an almost uninterrupted freefall since May 10th 2006. The decline had taken price down to an area of support around $77.50 (green line). This was the late January resistance which was expected to now act as support. BHI formed a hammer candlestick as price was pushed down below this support level, but bounced back to close up for the day. This was a clear signal that it had found significant and aggressive buyers. A logical entry was going long at the break of the hammer’s high. The logical place for the stop loss was below the low of the hammer (red line). Were price to trade there, it would clearly violate the support that had been recently found and tested. My exit target was the last swing high or around $86-88 (blue lines). BHI reached it in about 8 trading days. Of course, the tricky part is how you manage the trade. That is, how much room you give it and whether you use partial exits or not, and when. That goes beyond this discussion so I’ll revisit it in the future. Getting back to the energy sector (XLE), we now see almost back to back wide range, engulfing dark candles. They are very forboding and should be of concern to anyone who is still long. We might even be looking at a possible intermediate top here.